An Ariane 5 launcher fired into space Thursday from French Guiana, hauling two commercial satellites destined to broadcast television to Latin America for Intelsat, DirecTV and Argentina’s national telecom company. Heading for orbits 22,300 miles above Earth, the satellites lifted off at 2143:52 GMT (5:43:52 p.m. EDT; 6:43:52 p.m. local time) from the Guiana Space Center, a European-run spaceport located on the northeastern shore of South America. The 179-foot-tall Ariane 5 rocket lit its hydrogen-burning Vulcain 2 main engine seconds before firing two powerful solid rocket boosters to propel the vehicle away from the ELA-3 launch pad in French Guiana. Liftoff was delayed nearly 44 minutes due to storms at the spaceport. Powering up to 2.9 million pounds of thrust, the launcher surpassed the speed of sound 42 seconds after liftoff, weathering intense aerodynamic pressures as it rocketed into the stratosphere before shedding the two strap-on rocket motors, which supplied the bulk of the energy required to push the Ariane 5 into the sky. The rocket’s core liquid-fueled core stage kept firing until the mission’s nine-minute point, when it shut down and separated to fall back into the Atlantic Ocean. An upper stage HM7B engine ignited for a nearly 16-minute burn aiming for an egg-shaped orbit stretching from 155 miles to 22,236 miles above Earth. 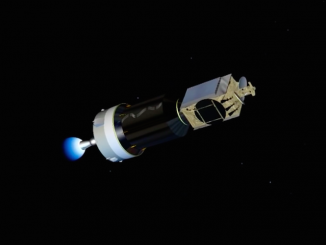 Deployment of the Intelsat 30/DLA-1 satellite riding in the upper berth of the Ariane 5’s dual-payload adapter system occurred 28 minutes after launch. The rocket then ejected a cover to reveal the smaller Arsat 1 spacecraft for its release a few minutes later. Officials inside the Guiana Space Center’s main control room erupted in applause with confirmation of the satellite deployments, and engineers working on the Arsat 1 project — Argentina’s first homemade geostationary telecom satellite — posed with the Argentine flag in a live video feed from the spaceport. 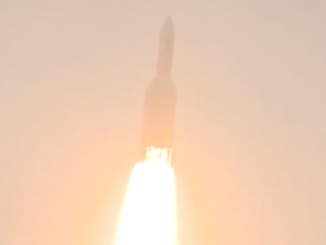 Stephane Israel, chairman and CEO of the French launch services company Arianespace, declared the mission a success, extending the string of flawless Ariane 5 flights to 62 in a row. “The two satellites orbited tonight will serve users located in Latin America, a region that has always had a special place in the heart of Arianespace, because this is where our launches take place, and also because our market share in the region has always exceeded 50 percent,” Israel said. Ground controllers confirmed they received signals from both satellites minutes after the launch, confirming the spacecraft survived the trip into space. Manufactured by Space Systems/Loral of Palo Alto, Calif., the 13,933-pound Intelsat 30 satellite was expected to extend its two solar array wings about three hours after launch, then kick off a series of thruster firings to raise its altitude over the next week to reach a circular geostationary orbit 22,300 miles over the equator. After deploying antennas and completing several weeks of testing, Intelsat officials said the satellite will enter service in late November parked at 95 degrees west longitude. Equipped with 72 Ku-band and 10 C-band transponders, Intelsat 30 is designed for a 15-year mission, joining Intelsat’s Galaxy 3C satellite in covering Latin America. DirecTV Latin America has leased spacecraft’s Ku-band payload to provide direct-to-home television programming to the company’s 18 million customers in Central America, South America and the Caribbean. A sister satellite named Intelsat 31/DLA-2 is being built under a similar arrangement for launch next year. 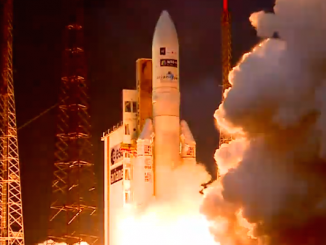 The 6,576-pound Arsat 1 satellite launched Thursday is the first large communications satellite built in Argentina. “After seven years working on the project over many hours of arduous teamwork, today the first Argentine telecommunications satellite is in space,” said Matias Bianchi, head of Arsat, Argentina’s national telecom company and operator of Arsat 1. Reportedly costing about $250 million, the Arsat 1 satellite carries 24 Ku-band transponders to relay television broadcasts, data, voice links and Internet access across Argentina, Chile, Paraguay, Uruguay and parts of Brazil and Bolivia, according to Arsat. Argentina set up the Arsat company in 2006 to fulfill rights to orbital slots assigned to the nation by the International Telecommunication Union. Without new spacecraft to use orbital positions allocated by the ITU, Argentina was at risk of forfeiting rights to operate its own communications satellites. Set to last 15 years, the spacecraft was built in Patagonia by INVAP, an Argentine high-tech contractor. INVAP is working on two more Arsat satellites, with the next one set for launch in 2015.